Nobuo Fukuda’s izakaya and omakase complemented by wines, sakés, beers and cocktails. 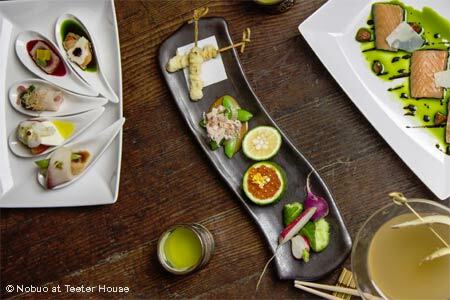 : The theme at chef Nobuo Fukuda’s restaurant is reminiscent of a true izakaya (small plates pub) in Japan, with room for about three dozen in the partitioned dining rooms and just four lucky folks at the omakase bar. The menu changes often to reflect the seasons (Fukuda sources ingredients from the coveted Tokyo Tsukiji fish market), but staples include a panko-fried soft shell crab sandwich on homemade focaccia slathered in kanzuri (chile-yuzu) aïoli; silky yellowtail sashimi decorated in grapefruit and avocado; and five-spice braised oxtail with udon and pho broth. Note that for a real indulgence, you need to call 24 hours ahead and request the omakase “chef tasting” menu. Whatever you choose, servers can recommend paired drinks, sommelier selected beers, sakés, wines and craft cocktails.